Hopes&Fears explores the history and uses of Max/MSP, and sees how the computer-human relationship changes from coders to non-tech sound artists. With the constantly growing popularity and ever-abstract nature of electronic music, it helps to sort through the sea by picking one concrete aspect and diving in. Today, Hopes&Fears looks at the revolutionary object-oriented computer program Max/MSP, that’s been used everywhere from the glossiest of club tracks to the most purgatorial waves of glitch. We examine the program's history and how its role changes from programmers to artists. — a computer environment for realizing works of live electronic music, combining pre-designed building blocks into configurations useful for real-time computer music performance. Talking to Puckette in San Diego where he teaches at UCSD, he explained how Max was developed in 1988, at IRCAM, because he had a concert scheduled. “It was being paid by IRCAM, which was the 'Institut de Recherche et Coordination Acoustique/Musique,' which is this research institution in Paris that was run by Pierre Boulez... They had the hardware all very well down, but they didn't actually have any idea how to write software for doing real-time music performances, and so every time anyone did a piece of electronic music at IRCAM, they would have to have the software custom-written for that particular piece. And so there was a piece coming up, and I was hired to help work on it,” Puckette explained. While many of the underlying ideas behind Max arose in the rich atmosphere of the MIT Experimental Music Studio in the early 1980s, Max would take its form throughout a heated, excited period of brainstorming and experimentation among a small group of researchers and musicians, composers, and performers at IRCAM during the period of 1985-1990. Max would be the second program Puckette wrote for IRCAM, but the first to be indefinitely reusable. It would take him a year. While the program took a year, Max was unfit for commercial distribution until 1990, when Pucket and Opcode Systems patented the interface. By the mid 1990s, software company and music label Cycling ’74 took over all development of Max with a new feature called MSP, an extension program to Max, allowing for real-time audio synthesis, and the addition would eventually become synonymous with Max. Sound and the combination of the sound is triggered internally/coded internally. One of the most common modalities, where the program extends the possibility of an instrument. This modality investigates the dynamic interplay within specific sights, spaces and places. Data Mining aligns the sounds which any given data set giving whatever music is created a sense of indeterminacy. Data mining can come from environmental sources, chemical components, architecture, biofeedback, any pattern imaginable. Max’s precursors are as varied as the program’s uses. The program’s namesake, Max Mathews, made strives in real-time computer music three decades earlier. He worked at Bell Labs and made MUSIC, the first widely used computer program for sound generation, in 1957. He was interested in composition as well as technology, and hooking up his violin to an IBM 704 computer in 1957, Mathews was one of the first to capture and synthesize sound from a live instrument for a computer composition. The methods Matthews laid out in the 50s would evolve as much as the source of the music would change depending on any composer’s specific vision. But Mathews's innovations had broken the wall. Mathews's earlier GROOVE program had emphasized the handling of ``voltage control" signals, sporadically occurring events which caused state changes in the synthesizer, but RTSKED separated the program into parallel tasks permitting the user to control the sequence of execution of the program by selecting which task to trigger next. RTSKED extended beyond music into triggered film. And while coding is the lifeblood of Max, Puckette is quick to note how artists were equally important in its creation, “Computer music software most often arises as a result of interactions between artists and software writers,” Puckette noted at "Max at 17," a speech he gave to commemorate the software on it's 17th birthday. 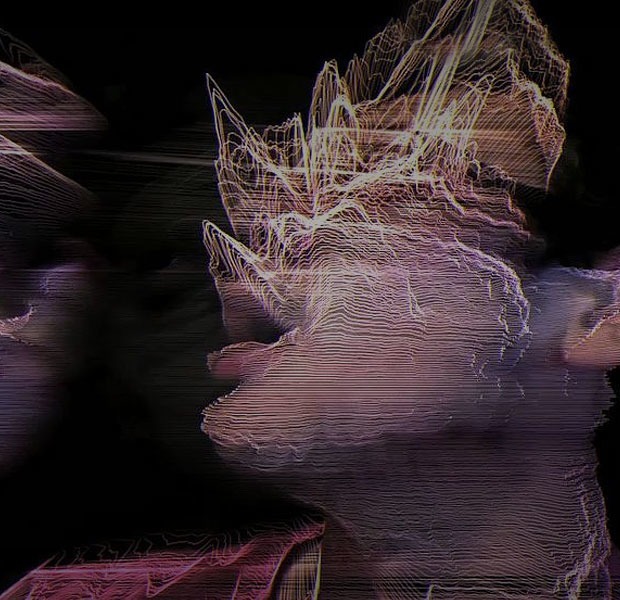 Tokyo based art collective BRIDGE makes colorful and often very surreal imagery using Jitter, the Max environment for visual processing and synthesis which provides real-time video, 3-D, and matrix processing capability. Hecker works in ambient computer music, using Max/MSP and Reaktor, among other programs, to digitally process and distorted live instruments from a guitar to a pipe organ. Max was the ability to mutate his abstractions, “I kind of consider it like a painter's canvas with sound... it's like a sculptural tool workbench, where you can hammer and stretch and melt, and do all these kinds of sculptural tropes.” From his Montreal home, Hecker talked about keeping an artist’s perspective intact rather than sweating the codes, and how relying on friends to code his patches has allowed him to maintain a more pure perspective. 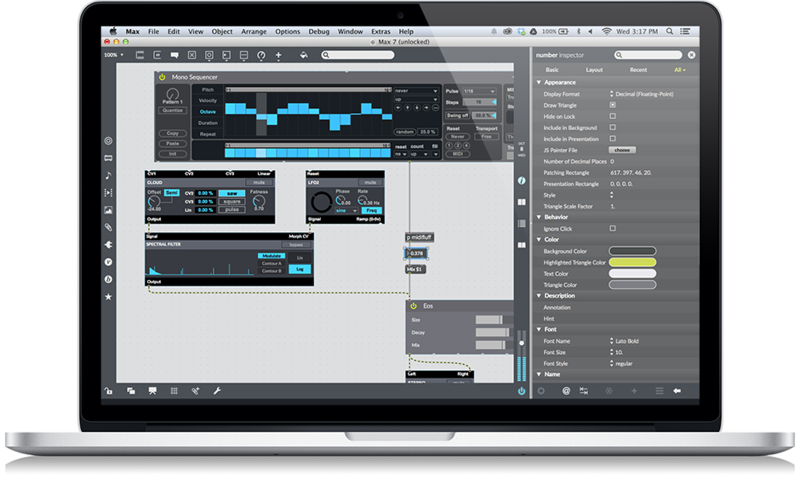 Allows users to construct “patches” that process signals – MIDI, audio, or video.“Deals with two- and three-dimensional collections of data instead of just signals going in time. And so it's suitable for processing images and the like. A computer programming language for sound written in C, also known as a sound compiler or an audio programming language. “It's kind of a risky thing for a musician because it's a world of code... it's hard to do both the design of making patches, and keeping the compositional aspects high-level, or meta. I understand a lot of the objects, and how things work in the architecture, but I've relied on people who have made patches for me, and that's the truth of it. I made little modifications, but I'm not a coder, and I've always kept that at arm's length. I'm [interested in] how I can take this type of material and turn it into compositional fruit. So I've always had people help me with that stuff, and I use a ready-made set of objects, one of them's called PPOOLL, it's something that I've been using for ten years or so, and it's probably like 40-50 Max objects in an environment, that are all networked together, and you don't really need to know anything about Max. It's very technical, using that set themselves, but you don't need to know a lot about coding, or patching even, to be able to get musical fruit." Whether experimenting in coding or simply looking for a means of expression, Max is an octopus producing ever-infinite fruit. The reference manuals, the tutorials, the help patches and the Max mailing-list/forum.